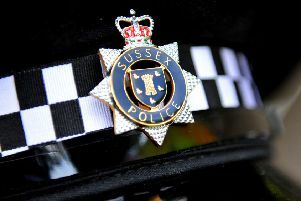 Emergency services were called to the junction of the A259 Brighton Road and The Saltings,where a black Ford Fiesta car had collided with a kerb and overturned shortly after 11pm, a police spokesman said. The driver, a 22-year-old woman from Southwick, and a rear-seat passenger, a 21-year-old man, also from Southwick, both sustained 'serious injuries', police said. A spokesman for the ambulance service confirmed that two ambulances and two cars were sent to the scene. One patient with a head injury was taken to Royal Sussex County Hospital in Brighton, the spokesman said - adding that the injury was not believed to be life threatening. Another patient with an arm injury was taken to Worthing Hospital, the spokesman said. Police confirmed two other passengers, a 22-year-old man from Shoreham and a 19-year-old woman from Southwick, did not require hospital treatment. The ambulance service left the scene between midnight and 12.15am. Anyone who saw what happened is asked to contact police on 101, quoting serial 1449 30/03.